Gretag Macbeth Spectro Eye is an accurate spectrophotometer combining accurate measurements of LAB and Lch with standard densitometric functions. The GM Spectroeye combines the ultimate in measurement accuracy with exceptional ergonomics and user-friendliness, setting new standards for colour measurement in the graphic arts industry. 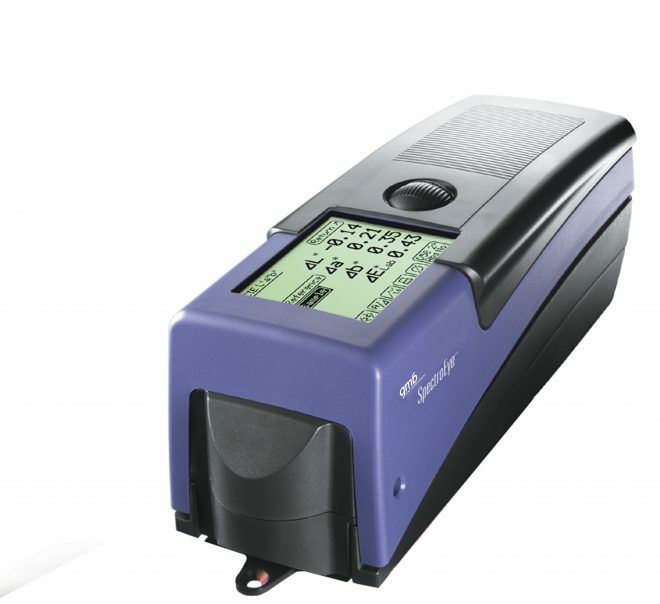 This handheld, portable spectrophotometer offers all the colorimetric functions needed to accurately measure and control special colours along with all the densitometric functions needed to quickly and easily monitor and control colour on press. The extendable measuring head enables exact positioning. The innovative track wheel eliminates the need for buttons to push and also allows left or right hand operation. Easily understandable menus, graphical icons and balloon help guide you step-by-step through the use of the measuring functions. Different measurement parameters can be selected making the unit ideal for most forms of accredication.